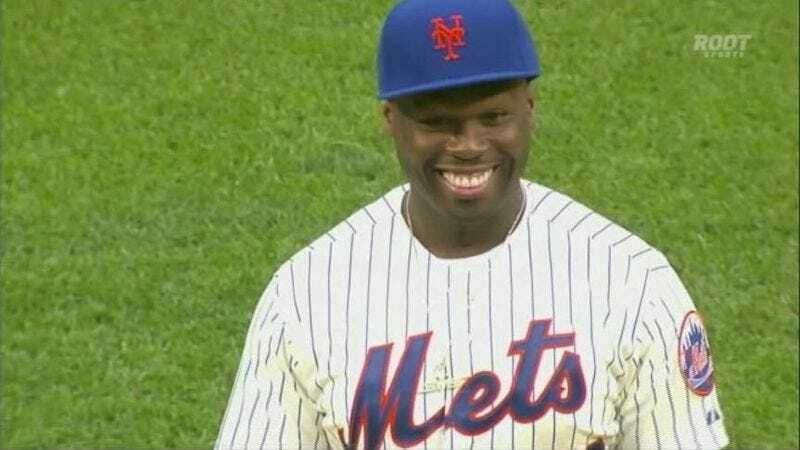 Last week, the world watched in amusement as 50 Cent threw out the first pitch at a Mets game, resulting in his worst hook since “Candy Shop.” But in a Reddit AMA session today, 50 revealed the very serious medical condition that led to his mishap. Who’s laughing now? In light of these revelations, we now see why 50 Cent became so adamantly anti-masturbation in 2012, when he first presented his four-step recovery method for knocking it off—and inevitably, for becoming a better baseball player. Today’s AMA was short on similarly useful advice and unfortunately long on food-related questions, though he did offer some wisdom related to the eternal conundrum of whether to get rich or die tryin’: “Focus on gettin’ rich you gonna die anyway. Let’s live good,” 50 wrote, with the unspoken implication that “living good” doesn’t include touching yourself. Elsewhere, he also addressed a recent report that he’d been involved in the robbery of rapper Slow from the duo Slowbucks—one of his many rivals, for reasons that are murky and tedious to explain—which apparently took place on stage at Hot 97’s recent Summer Jam concert. While video documented a fracas in which a man clearly snatches a large gold chain believed to belong to Slow, and subsequent photos show that chain ending up around the neck of 50 Cent as he continued to perform in front of the 80,000-strong audience that had just witnessed the robbery, 50 acted as confused by the whole story as anyone else who just read this paragraph. Still, according to this Variety story that appeared on this, a day in which there is a lot of 50 Cent news for some reason, 50 could have been far less forthcoming. Talking about the rapper’s contributions to Starz’s Power, the crime drama about a shady nightclub proprietor he’s executive producing, star Joseph Sikora discussed how 50 had provided his invaluable insights throughout the development process. “I’d send him an idea or a picture, he’d respond with a lot of LOLs and Emojis,” Sikora wrote of grown man gangsta rapper 50 Cent, whom he also praised as an “easy guy to get in touch with.” After all, not jerking off frees up a lot of your time.